When things go right, this business of measuring an ocean appears to be easy; when they don’t, you’re reminded of just how difficult it is. First, there is always the press of time. These expeditions are tightly scheduled, and ship time is very expensive. Lisa’s project, officially titled The Agulhas Current Time Series (ACT), is scheduled for 24 days. Usually, several weather days are factored into the schedule, but everyone is aware that the work must get done within that fixed period. So the lost day waiting for the errant container added a degree of tension before we even left the dock. 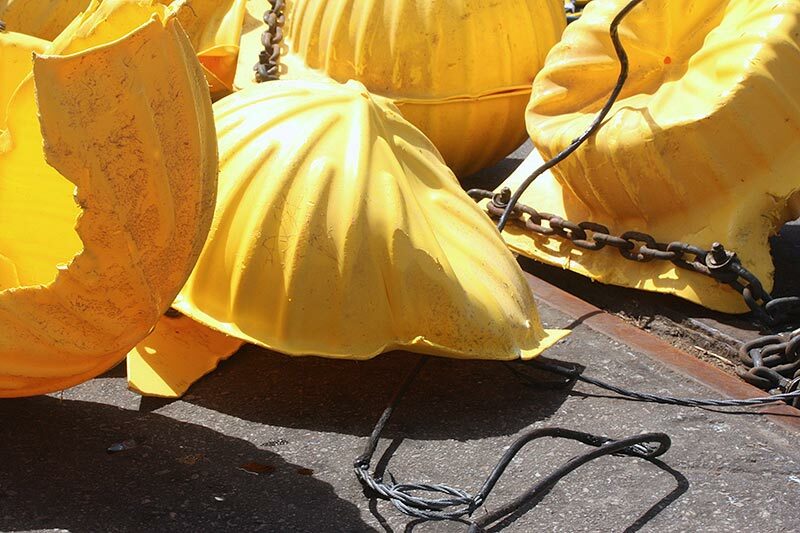 And we knew when we cleared the sea buoy that we’d have to return to Port Elizabeth to collect the gear in the second errant container supposedly arriving on November 7, a troubling but unavoidable delay. We’ll talk at greater length in the days to come about the specialized equipment required to measure ocean circulation, but in order to understand the present problem before us—and the nature of the game—a quick précis will suffice. 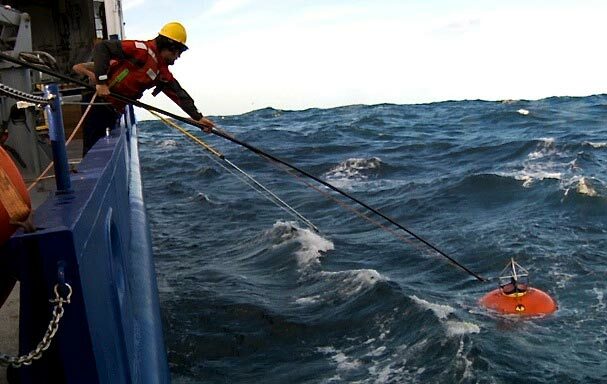 The mooring, the workhorse of physical oceanography, consists of a wire with a heavy anchor at the bottom and a large float supplying some 2,000 pounds of buoyancy at the top to keep the wire vertical in the water column. Onto this wire, Lisa and her team of technicians attach instruments to measure the velocity of the flow. The seven moorings, which we put in the water last April, can remain there gathering data for over a year before their batteries expire. Part of our present objective is to pull the moorings aboard, off load the data, change batteries, and put them back in the water. Sounds simple said that way—but not always. You still have to get them aboard the ship. 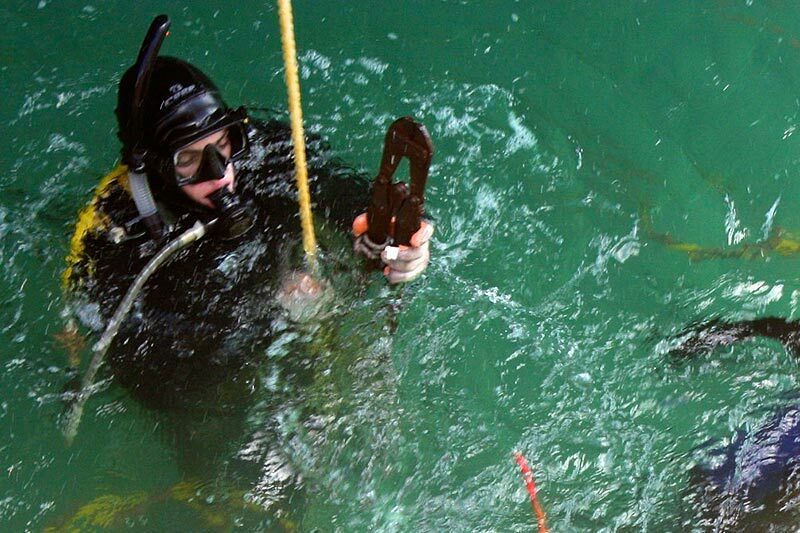 After technicians successfully brought the first mooring to the surface off the starboard side, they stood by with hooks ready to bring it aboard. But while the ship was being maneuvered in difficult wind-and-sea conditions, the wire along with some additional flotation became fouled in one of the ship’s propellers. That mishap left us no choice but to steam ten hours back to Port Elizabeth for a diver to clear it. And so here we are, that problem solved, only to be confronted with another—weather. 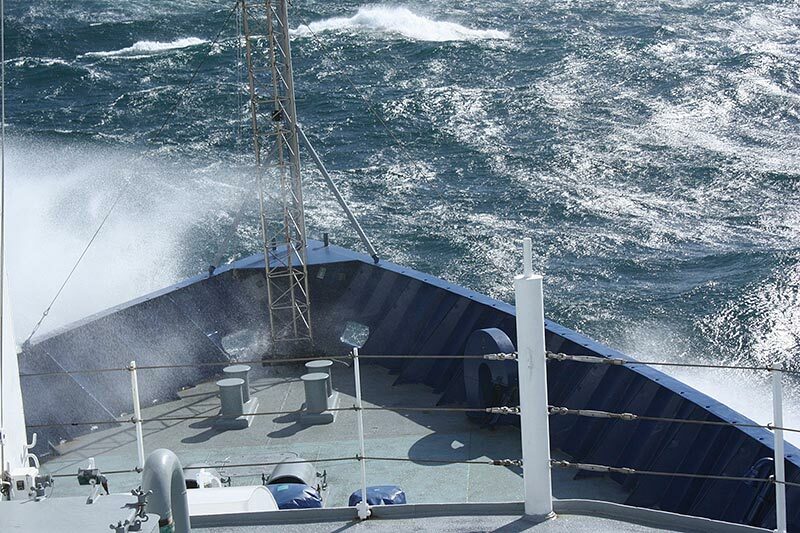 Forecasts are calling for 50 knots of wind and towering seas as the southwest wind blows against the rushing Agulhas Current. There’s no sense in steaming back to the study line only to find that the state of the sea precludes further mooring work. The present plan, then, is to remain in port until early tomorrow morning when, hopefully, the waves lay down enough to work. But there still remains the problem of that other absent container. We’ll need to return here on the 9th to collect its contents. We all feel sorry for Lisa as she sits at her computer revising her cruise plan still again. But she’s an experienced professional who recognizes that things don’t always run smoothly in this complex and difficult game, and she’s taking the delays as calmly as possible. We can only hope that events thus far are anomalous, not part of an evolving pattern. But we’ll find out.